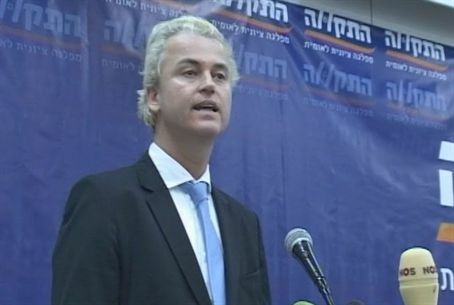 Dutch politician Geert Wilders was in Israel on Sunday and gave a speech in Tel Aviv at a conference of the HaTikvah movement, headed MK Prof. Aryeh Eldad (National Union). Before the conference, MK Eldad spoke with Israel National News TV and explained his own proposed two-state solution in which two states refers to the State of Israel and the Kingdom of Jordan. Wilders blamed the Arab leaders as well as Islam for what he called “the plight of the Palestinians in refugee camps in Lebanon, Gaza, and other places,” and said that ‘Palestine’, where many say that the PA Arabs should return, is, in fact located in Jordan. He added that Israel must not trade land for peace and not “assign Judea and Samaria to another Palestinian state – a second one, next to Jordan,” since, as he said, the conflict in the Middle East is not a conflict over territory, but rather an ideological battle. Wilders mentioned the expulsion from Gaza of 2005 and said that this “sacrificing” of land by Israel did not attain peace but rather made the situation worse, simply because the conflict is ideological. “Ideologies must be confronted with the iron will never to give in, ‘never, never, never, never – in nothing, great or small, large or petty.’ That is the lesson which the world learned from Winston Churchill when he confronted the evil ideology of Nazism,” said Wilders. “Allowing all Palestinians to voluntarily settle in Jordan is a better way towards peace than the current so-called two-states-approach (in reality a three-states-approach) propagated by the United Nations, the U.S. administration, and governing elites all over the world,” he said. “We only want a democratic non-violent solution for the Palestinian problem. This requires that the Palestinian people should be given the right to voluntarily settle in Jordan and freely elect their own government in Amman. If the present Hashemite King is still as popular as today, he can remain in power. That is for the people of Palestine to decide in real democratic elections. My friends, let us adopt a totally new approach. Let us acknowledge that Jordan is Palestine.